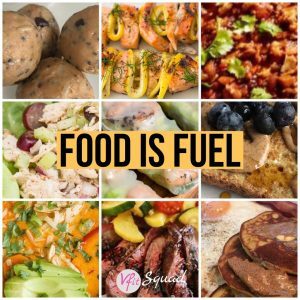 An important topic that is often overlooked is the importance and value of food as fuel for your body. So many emotions can be involved with eating, add to that marketing ploys and crazy diet trends, it can be a real challenge to find what works for you and stay consistent. Great news! If you are confused about what to eat, you are not alone! Today more than ever, we are in an age of information overload. Niche diets touting benefits from reverse aging, increased energy, magic chocolate cookies that will burn fat, are everywhere, along with snack-size and portable options for convenience, and it can be a real challenge to navigate the grocery store and know what to eat. If you dial it in and get down to the real basics, you can find an easier way to view your food intake, AND better promote your wellness. View your food as fuel, and each bit as an opportunity to nourish your body, and everything shifts! Your body needs healthy fats (fat is NOT bad, just bad fats are bad) to fuel your brain, build muscle, and optimally function. When you turn to low fat this, and low fat that, you need to take a moment and read that label, what are they replacing the fat with? Look to increase HEALTHY fats in your diet in the form of omega-3’s and you’ll find you are full longer, eating less, and performing better. Great sources of omega-3’s are eggs, fish, avocado, and nuts, for example. Your body needs WATER. Nothing simpler than that. Yet, more than half our population runs dehydrated daily. Energy slumps, brain fog, fatigue, muscle soreness, headaches, slower metabolism … the list goes on and on for what can go wrong when you deprive your body and brain with the water that is essential to properly function. Shoot for 1/2 to one ounce of water per pound of body weight PLUS an additional 10 ounces for per half hour of exercise, on average. Take a moment, do the math, and check in with yourself today. Have you been hitting this range? If not, drink up buttercup! Your body needs antioxidants, vitamins, fiber, and minerals which come from eating a variety of fresh produce each and every day. Fill your plate with half veggies at each meal with a range of colors and you’ll cover this task with ease. Look to mix up the combinations to reap the most benefits. And eating your veggies doesn’t need to mean eating a salad every day! You can roast them, or keep them raw and throw them in a well balanced smoothie with Greek yogurt. Make a soup or stew. So many options. Your body needs quality protein for muscle repair, build healthy bones, skin, and blood just to name a few functions. Not only that, protein helps your body make enzymes which are needed for every chemical reaction in your body. You want high quality protein to get this job done. Lean meat, beans, yogurt, milk, even peas are an awesome source. How to get this all in? Work on developing the habit of a weekly meal plan. Yes, that sounds like work, but what this does is set you up week after week for SUCCESS in knowing you are hitting up all the essentials you body needs. You can overview your whole week and mix in a variety of vegetables and proteins, and have fun with the kind of food you are eating. From varied themes like Mexican or Italian, to different textures like roasted veggies and steak one night, to a hearty turkey and sweet potato chili, and a thai chicken salad. Just a few thoughts to help you perhaps view your food as fuel and as an opportunity to give your body more of what it needs, and less of what it doesn’t. And what it doesn’t need is preservatives, fillers, high fructose corn syrup, crazy sugar alternatives, food dyes … the list goes on and on. Give your body more of what it wants, and you’ll layer on healthy habits and start hitting up less of what it does not need. Ok, maybe that sounds a little rough. There’s also this awesome nutrition philosophy of the 80/20 rule where you eat all the good stuff mentioned above, but then you allow yourself that other 20% where you do have that cake if you plan for it and are at a wedding, or still go for that pizza on Friday night with the family. You indulge, with no guilt, and then you move on and go right back to healthier eating options the rest of the time. Ahhhh!!! There’s a lot here. But if this was helpful and you’d like to learn and work on some of these principles and more with a nutrition coach, I’m here for you and we still have space in my next session with kicks off on Monday. It’s a 21 day nutrition clean up group.